Jennifer Garner and Ben Affleck Breakfast With Their Girls! 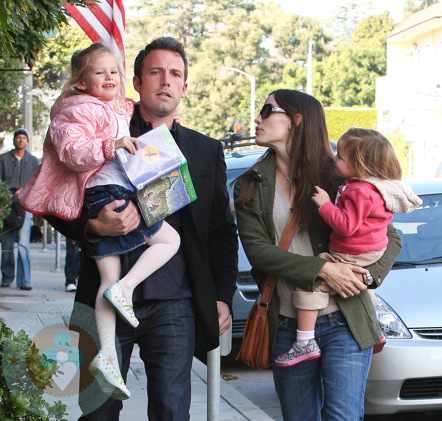 Home » Jennifer Garner and Ben Affleck Breakfast With Their Girls! Jennifer Garner and Ben Affleck enjoyed some family time with their girls in Brentwood yesterday. The Afflecks were photographed after having breakfast at Kay ‘N Dave’s Mexican Restaurant before running some errands. Look for Jennifer to appear on Martha Stewart’s Holiday Open House show next Monday, where she will craft and cook with the famous homemaker! Celebrity Families Enjoy Yo Gabba Gabba! Live! Michael Douglas & His Family Celebrate at Disney World! What an adorable family. It’s great to see them still together and all seems to be going well for them!